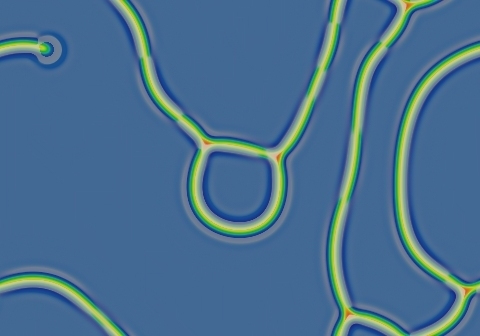 These images and movie demonstrate the behavior of the Gray-Scott reaction-diffusion system with σ=Du/Dv=2 and parameters F=0.0980, k=0.0550. 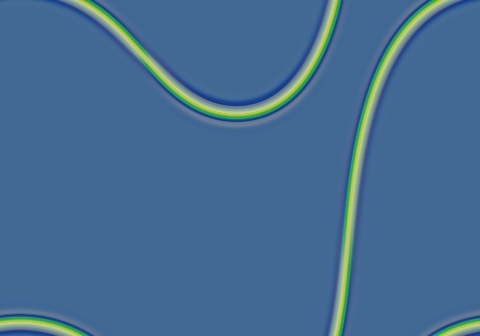 Any starting pattern will quickly fill the field with blue; blue spots remain separate for a while creating a pattern of linked negative loops; these then gradually coalesce as smaller loops shrink and boundaries occasionally break down. This is an almost exact negative of the phenomenon seen immediately to the east, although faster. 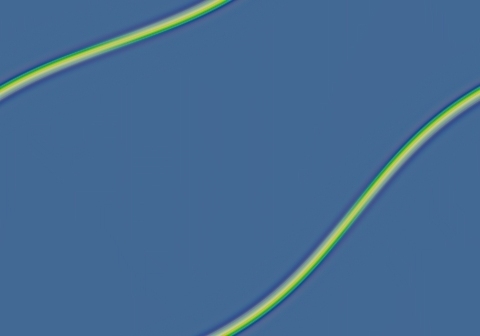 At the end we see a single curved line; this becomes almost completely straight after about 1,000,000 tu.